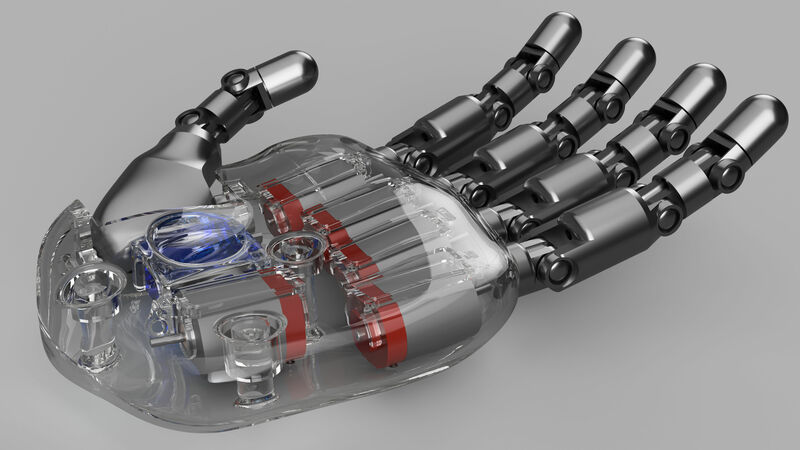 This is an electronic hand that I designed for the club I'm involved with, Digi-Digits. We are aiming to replicate the mechanics of a human hand by using fishing-line that will act as tendons. The fishing line will be connected to the shaft of the motor, then routed through channels in the bottom-side of the finger, and tied off near the tip of the finger. When the fishing-line is wound around the shaft of the motor, the tension of the string will cause the fingers to close toward the palm. Elastic bands will be attached from the back of the palm to the top side of the fingers in order to return them to the open position when the tension of the fishing-line lets off. There is a servo with a gear to control the side-to-side motion of the thumb. The palm is rendered in glass so that you can see the motors, but the actual hand and fingers will be printed in PLA plastic. This model is more of a proof of concept at the moment, and we were aiming to keep it very low cost by using parts that we already had. You are correct that these motors will not be able to deliver enough force for this to be a functional hand. I had looked into linear actuators, but we decided not to used them for the first prototype due to cost. Thanks for your help! OK, I looked. Those R130 motors don't have nearly enough power. Perhaps with enough gear reduction but there is not space for that. You might want to look into these linear actuators: https://s3.amazonaws.com/actuonix/Actuonix+PQ12+Datasheet.pdf Notice the spec's force is great than 3N. I've been looking into the design of human-like hands and found yours. 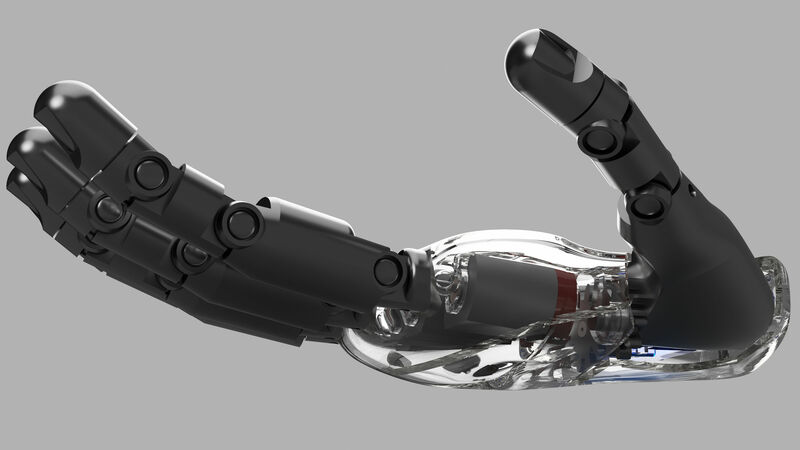 I assume you know about the "Ada Hand" from Open Bionics. Yours is a little different. I wonder about the power. Have you done any prototyping work with just the motor? How much force can you put on the string? did you model a specific motor are are they arbitrary? Looks fine. Maybe you might consider making the motors A motional and have the line run like an elevator cable intead. The motors have to run in both directions. And you might want to add pulleys to the ends of the fingers and the motors.